With the vampires vs. werewolves saga of the Underworld movies having been pretty much played out, the producers have adapted a similar good vs. evil mythos. After a brief prologue that nods towards the original Mary Shelley novel, the monster – played with surprising intensity by Aaron Eckhart – finds himself surrounded by demons under the control of Prince Naberius (Bill Nighy). However, the monster is rescued by gargoyles and taken in chains to Queen Leonore (Miranda Otto). To us humans the gargoyles seem to be mere decorations on old cathedrals, but in fact their dwindling forces are the only thing protecting humanity from the demons. While no one will confuse this with Ingmar Bergman’s films contemplating the meaning of life and death, the script by director Stuart Beattie allows for some complexity. The gargoyles want to dispose of the soulless monster but Leonore sees a creature who might have been made by man but has had little opportunity to develop his own humanity. She names him Adam and urges him to work with the gargoyles. He has his own ideas and is soon on his own. "A fast-paced and slickly made film that holds your attention . . ."
There follows various battles and set pieces, including an impressive attack on the gargoyle cathedral in which the demons who are killed descend to hell in flames while the gargoyles similarly incapacitated ascend to the heavens in white light. It makes for such an impressive fireworks display one wonders how the mere mortals avoid noticing it. To propel the plot forward Naberius has a plan involving the monster and the journal of Viktor Frankenstein, and has Dr. Terra Ward (Yvonne Strahovski) working on experiments to resuscitate dead tissue with electricity. Nighy is just asked to be evil here (as in the Underworld films), but he is still a pleasure to watch. He manages to get more from a glance or a raised eyebrow than other actors get with a long speech. Indeed, other than Nighy, the only ones who can be accused of acting instead of simply inhabiting their roles are Otto and Eckhart. Otto is clearly the “good” queen yet presents enough ambiguity that when the monster claims there’s not much difference between the two sides early in the film we’re not so sure he’s wrong. As for Eckhart, while no stranger to genre films (The Core, Battle Los Angeles) he’s also an actor with serious mainstream credits and may be the most unusual casting for the monster since Robert DeNiro in Kenneth Branagh’s Frankenstein made twenty years ago. He plays him as a creature facing an existential crisis. He’s not demon, gargoyle or human, so why should he take sides? In a sense, the film is about him figuring out the answer to that question. 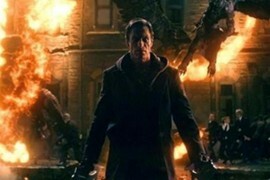 I, Frankenstein isn’t a masterpiece, but it is a fast-paced and slickly made film that holds your attention. At this time of year, when genre pictures are released to compete with the Oscar contenders from the previous year, that’s a very good thing indeed.